Our readers probably recall the clarinet blogs we have written about in the past: David H. Thomas’ The Buzzing Reed, Sherman Friedland’s Clarinet Corner, Marco Mazzini’s ClariPeru. We’d like to mention a few blogs that have caught our attention recently and made it into posts on our Clarinet Cache blog. Back in August, we posted about Marion Harrington’s Clarinet Blog. Marion Harrington is a clarinetist living in the Spain who began a clarinet performance degree, but before graduating she decided to quit playing and pursue other career options. After over 20 years in a variety of other fields, Harrington decided to return to the clarinet and dedicate herself to returning to practicing and performing at a professional level. Her blog therefore has the fresh perspective of someone who has returned to the clarinet "fold" later in life - passionately and systematically. She posts her thoughts on practicing, interpretation, and clarinet equipment, along with other subjects such as business and marketing, and the future of classical music in general. Another new addition to our blogroll is the Musician’s Way Blog. Designed as a companion site to the 2009 book The Musician's Way by Gerald Klickstein, MusiciansWay.com stands alone as a great resource for musicians. It is organized into five main subject areas (practice, performance, wellness, creativity, and music careers), each containing a wealth of information and links to primary sources such as scholarly articles, YouTube videos of master teachers, photos, and more. Any instrumentalist or vocalist has much to gain by exploring this site - find employment statistics, memorization strategies, scholarly articles on musician injuries, and everything in between. Clarinet-Now.com was created by Christopher Jones, a clarinetist in the Greater Hudson Valley area of New York State and student of Kalmen Opperman. The site has many inspirational strategies and tips for sight-reading, scales, crossing the break, and more, with great photos of correct and incorrect embouchure and hand position. 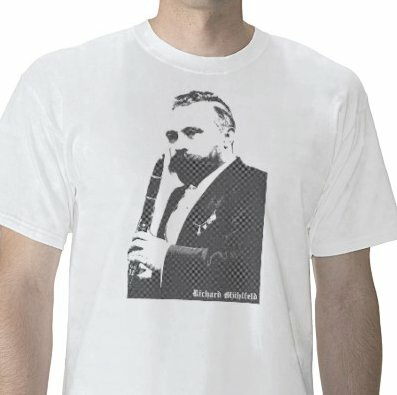 Clarinet-Now also offers a selection of items including a Richard Mühlfeld/Brahms T-shirt and clarinet high-top shoes! The numerous ads are somewhat distracting, but the content of the site is useful, especially for beginners (and their parents), and teachers looking for a new way to explain specific aspects of clarinet technique. Keep up with the latest on the Clarinet-Now blog. Many other clarinetists are blogging about practicing, performing, and their lives as clarinetists, including Anthony McGill, Jean-Francois Charles, Joar Klæboe Henriksen, Margaret Donaghue Flavin, and Bret Pimentel. Television plays a major part in the American lifestyle, and before the era of TiVo, audiences had to sit through countless commercials. Now, many of those commercials are posted on YouTube for people to watch voluntarily! We were curious to find out how many of those commercials feature the clarinet. After an exhaustive search, we compiled a list of commercials--some of which you may remember seeing. Ranging from large corporation productions to local advertisements, our list includes new and out-dated commercials, with some that are sure to make you laugh. Our top four favorites begin with a Doritos commercial, mis-appropriately titled “Clarinet Virtuoso.” I guess that goes with the saying that eating and playing don’t mix. Next on the list is one of the most recognizable videos produced by MasterCard. Their catchy slogan of comparing the costs of objects to what is priceless could not be better portrayed than with a beginner’s first attempt at the clarinet. MasterCard suggests that parents could avoid headaches caused by the inevitable honks and squeaks by purchasing their child a tambourine instead! A video featuring a local advertisement by Ray’s Midbell Music is funny not only because of the actors (they must have been store employees), but also because of the rap song they sing to encourage kids to play in the band. Last but not least, Benny Goodman is featured in a Geico commercial. This vintage footage shows the legendary Goodman endorsing the insurance company with clarinet in hand. Check out our YouTube Clarinet Commercials playlist for more. The remaining commercials were chosen for their accompanying clarinet music, and the products advertised make us wonder about the associations the general public has with the clarinet. The videos include promotion of cat litter and anti-depressant drugs--as most of us clarinetists know, playing makes us happy and has natural mood-lifting abilities. One related commercial has nothing to do with the clarinet, but fits in the woodwind category. A Super Bowl commercial featuring NFL player Chester Pitts shows that one doesn’t always have to choose between music and athletics. This large linebacker also plays the oboe off the field--even in the locker room. Sunday was Clarinet Choir Day at ClarinetFest. Although weary from a long week of clarinet events, we made it back to Bates Recital Hall on Sunday to catch the clarinet choirs of the Dallas Wind Symphony and the Lone Star Wind Orchestra. Our favorite piece (although we may be biased!) was the Enesco Romanian Rhapsody, arranged by Dennis Fisher (director of the UNT Symphonic Band) for the Dallas Wind Symphony clarinets with UNT professors James Gillespie and John Scott as soloists. This work began slowly but gradually worked into a frenzy, with lots of great Romanian themes and an exciting finish. The Lone Star Wind Orchestra then took the stage beginning their program with a world premiere performance of Christopher Tucker's Chester Fanfare, followed by Jukka Linkola's Chalumeaux Suite, featuring exposed solo passages played by David Gonzalez on b-flat clarinet. Once again, time constraints did not allow the group to perform all the scheduled pieces; however, the last piece of the program showcased each instrument of the clarinet family, giving each section a chance to show off the multitude of talent within the group. It was a hectic week and we didn't attend even half of what we would have liked to, but the Austin ClarinetFest was a well-attended, busy festival with quality programming. Congratulations to Richard MacDowell and Nathan Williams for an incredible ClarinetFest 2010! Arriving late to the 8:30am Festival Features #3 program due to a misunderstanding of the shuttle pick-up location, the first half of the program was unfortunately missed. I (Kellie) finally got there in time to hear Jesse Krebs play Muczynski's Fantasy Trio. Kreb's sonorous tone blended perfectly with the cellist, and great musicianship was demonstrated across the trio. The rest of the morning program was nicely filled with various ensembles, with the program order changed to accommodate additional performers. Next was the D2 Clarinet Duo, two Colombian clarinetists Mauricio Murcia and Jorge Andres Velez Ospina performing original compositions by Murcia himself. The lively and energetic performance showcased traditional Colombian folk dances and added an authentic Latin flavor to the program. Added on to the program was a piece with unusual instrumentation for clarinet and hand-held drum. Although I couldn't hear the announcement of the performers' names or the piece, it was an interesting contemporary, yet melodically oriented work that is worthy of more performances. Mid-morning on Saturday at ClarinetFest was filled with performances of newer works, leaving many of us with difficult decisions to make! Robert Spring and Jana Starling played at 10:30, and Richard Faria was to debut the winning piece of the ICA Composition Competition at 11, while Scott McAllister's lecture-recital "McAllister on McAllister" was scheduled from 10:30 to noon. He started a half-hour later to allow people to hear Robert Spring's performance, so I (Rachel) was able to catch Glen Hackbarth's Flux, Whitney Prince's Spin, and William O. Smith's Four Duets for Four Demi-Clarinets. The Smith work was a world premiere written specifically for Spring and Starling, and featured each player performing on two halves of the clarinet at once. Everyone was fascinated with the unique sound of the demi-clarinets, and the two players joked around on stage quite a bit. The combination of their individual virtuosity and their dynamism as a pair makes their performances a complete joy to hear. Next, people filled a classroom to hear Scott McAllister's presentation about his life and work. He shared the story of his promising career as a clarinetist which was cut short by a car accident that damaged his right hand. McAllister said that after the accident, he began to focus on composition, and talked about the inspiration for such pieces as X, Black Dog, and Bling Bling. He played X in its entirety as well as part of Bling Bling, and impressed everyone with his abilities as a clarinetist despite his injury. He also offered some tips for clarinets working on his music, emphasizing that in his music, style and energy is more important than notes. A highlight from the afternoon was Eric Mandat's premiere of his Three Studies, composed specifically for the celebration of Stanley Hasty's life and teaching. This work featured an all-star clarinet ensemble of Hasty students with Eric Mandat conducting, and was based on etudes that Hasty used in his teaching. The work was a great end to the afternoon-long celebration of clarinet legend Stanley Hasty. The Saturday evening concert at Bass Concert Hall was a concerto concert, featuring soloists with the ClarinetFest Orchestra. First was Alan Kay with an exciting performance of the lesser-known Busoni Concertino. Then Philippe Cuper dazzled the audience with his rendition of Spohr's Concerto No. 2. Probably one of the most difficult clarinet concertos, the piece frequently ascends to double high C, and demands great technical virtuosity from the soloist -- which Cuper certainly delivered. The second half of the concert began with Sergoi Bosi playing two shorter Italian works for clarinet and orchestra. He engaged the audience (and orchestra) with his confidence and expressive physical presence onstage. The Copland Concerto is probably the most well-loved clarinet concerto of the twentieth century, and José Franch-Ballester's commanding performance was outstanding even at a ClarinetFest filled with great performances. The appreciative audience was instantly on their feet to give him the old "Texas Stand-up"! With all of the great programs scheduled during the festival, it's hard to choose which ones to attend and there is never enough time to take everything in. Taking the morning off from concerts to spending time to peruse the exhibit booths was a nice break. With so many vendors to visit, it was easy to feel like a kid in a candy shop. All of the accessories, instruments, and music booths were divided amongst the three separate rooms, all of which were busy, sometimes filled with people elbow to elbow. The cacophony of clarinet sounds coming from some of the rooms was deafening and it was necessary to step out into the hall to get a breather; however, the excitement was contagious and seeing so many familiar faces was more than welcoming. Coming to festivals like this is a reminder of how friendly and personable the clarinet community is. After spending more than nine years as a resident of Texas, I (Kellie) made it a point to see the Texas Artists-Teachers concert in the Bates Recital Hall. A majority of the program consisted of chamber works starting with a light-hearted clarinet, flute, piano trio by Donald Draganski. The next work was Rebecca Clarke's Prelude, Allegro, and Pastorale for clarinet and viola with David Shea's dark and warm timbre blending nicely with violist Renee Skerik. The third piece, Ben Stonaker's Lachrymose (2010) for Clarinet (B-flat and Bass), Violin, and Viola, added a nice contemporary edge to the program. The descriptive movement titles alone suggest the overall mood of the piece: "dust in a sunlit stairwell," "tiny fragments of things that were no longer there," "floating aimlessly," and "sinking slowly." Multiphonics and other contemporary techniques were employed throughout the piece, adding to the overall effect of subtle texture and timbre changes. At one point in the music Mary Alice Druhan removed her bass clarinet mouthpiece and blew into the neck, creating an eerie sound as she voiced notes with only her air stream. The next piece featuring clarinetist Richard Shanley lightened up the mood of the program. His trio played Libby Larsen's Barn Dances for flute, clarinet, and piano, which is a four-movement work inspired by cowboy dance steps, with the second movement being an homage to Gene Autry. Always a standard piece at clarinet festivals, the Poulenc Sonata was then played by UT alumna Mary McKinney Schani. The following Trio in B Minor by Edouard Destenay for clarinet, oboe, and piano showcased clarinetist Christopher Ayer's polished technique and lyricism alongside the spectacular piano playing by his wife Kae Hosoda-Ayer. Closing the concert, the Texas Clarinet Consort's jazzy tunes proved to be a great way to wrap up the program. The second piece, "When I Fall in Love" was dedicated to the late David Etheridge, who passed away shortly after ClarinetFest began and will be greatly missed in the clarinet community. Both the performers on stage and the audience could feel the sadness and loss through the group's tender rendition of the tune. Following up with an upbeat Texas Clarinet Consort favorite, "A Toot in Ninesia," many giggles could be heard throughout the audience as the players themselves let loose and enjoyed the piece as much as the audience. Meanwhile, the "Bass Clarinet Blow-Out" was happening in McCullough Theater. Sponsored by Rico, the concert opened and closed with bass clarinet ensemble pieces, with solos and duos in between. The first piece was an arrangement of Paquito D'Rivera's "Afro" from Aires Tropicales for five bass clarinets: Lawrie Bloom (USA), André Moisan (Canada), Rocco Parisi (Italy), Alcides Rodriguez (USA), and Pedro Rubio (Spain). It was a nice arrangement, and though rhythmically challenging, the group performed it well. Other highlights of the concert were André Moisan's performance of his own piece Quantum Leap for solo bass, and Lee Hyla's We Speak Etruscan for bass clarinet and bari sax, performed by Alcides Rodriguez and Nathan Nabb. The concert concluded with a giant bass clarinet ensemble playing Michael Smetanin's exciting Ladder of Escape. For all the bass clarinet enthusiasts in the audience, it was spectacular to hear these bass clarinetists all together on one concert. The Friday evening concert at Bass Concert Hall featured the three famous clarinet quintets by Mozart, Weber, and Brahms, performed by the Grammy-winning Enso Quartet with three stellar clarinetists. First was Franklin Cohen's rendition of the Mozart, then Greg Raden with the Weber, and Richie Hawley performing the Brahms. Unfortunately, we were late getting to the hall in time to hear the first piece, but while waiting in the lobby to enter the concert hall, we could see and hear Franklin Cohen performing the Mozart Quintet with the Grammy nominated Enso String Quartet on a large-screen television. Also piped into the bathrooms, it was clear even through the speaker system how beautiful Cohen's tone was. After the exquisite melodies of the Mozart, Greg Raden took the stage to perform the Weber Quintet. One would never guess that Raden and the quartet had only two rehearsals prior to the performance. The overall ensemble effect was impeccable as melodies were seamlessly passed between players. To everyone's amazement the tempo of the last movement was quite swift, yet as usual, Raden's beautiful resonant tone and facile technique never faltered. A change of program order placed the Brahms Quintet last and once again the Enso Quartet returned to the stage to play with Richie Hawley. In this group, the seating arrangement was altered so that the clarinetist was on the outside right corner instead of the middle, and this created a noticeable difference in the balance of the group from where we were sitting. Although Hawley was positioned away from us, it did not prevent his expressiveness and excellent musicianship from shining through. The Enso Quartet exhibited an expressiveness and sensitivity rarely heard in live performance. The level of musicianship of the players was enthralling, and audience turnout was probably the highest of any of the evening concerts. This concert was a clear highlight of the entire conference. For me (Rachel), Thursday of ClarinetFest was a day of clarinet and electronics. I performed on the Electronics Potpourri concert at 1 PM, so my morning was consumed with warming up and rehearsing the piece. The dress rehearsal was fairly hectic, since everyone needed time in the hall, but each performer had different tech needs. Some players used video, some performed with CD accompaniment, and others (like me) were doing interactive works with computer. I think in the future it may be better to have everyone rehearse in order due to the complex tech changes between pieces, but it ended up working out fine. During the concert, I had fun hanging out backstage with the other performers: Leslie Moreau, Michael Dean, Mauricio Salguero, Karen Dannessa, and Elizabeth Gunlogson. My performance got off to a rocky start - I spent a couple of awkward minutes onstage while the sound engineer fixed a technical issue. But these things are normal when performing interactive music, and after we got the piece running I think it was a successful performance! One standout piece from the afternoon that clarinetists and composers seemed to really like was Samuel J. Hamm's piece fixion for clarinet and computer, played by Leslie Moreau. Overall, it was great to experience ClarinetFest from a performer's perspective, and kudos to all the great volunteers coordinating the stage management! After my concert I was able to stay to hear electronic gurus Gerry Errante and D. Gause perform works by Andrew May, Russell Pinkston, and Christopher Hopkins. The afternoon of electronics continued with performances by Michael Lowenstern and Laura Carmichael. As a player with interest in the field, I thank Nathan Williams for coordinating this afternoon of music for clarinet and electronics, as it is a small but growing genre that is becoming more approachable as our computers become faster and more powerful. Greetings to everyone in Austin, and following along at home! The ClarinetFest has gotten off to a great start today, with clarinetists of all ages and nationalities descending upon the Butler School of Music at the University of Texas. I (Rachel) arrived yesterday for a dress rehearsal of the piece for clarinet and computer I will be performing tomorrow, and was greeted by volunteers, technical assistants, and Nathan Williams himself who was making sure everything was running smoothly. Things seem very organized so far, with great-looking program books and lots of volunteers helping out. This afternoon, I was able to catch the Host Recital as well as Richard Nunemaker's performance. The Host Recital began with Nathan Williams performing a new piece for clarinet and piano by Karim Al-Zand (Rice University), commissioned by a collective of clarinetists. Titled Cabinet of Curiosities, the work at times took inspiration from dance rhythms (waltz, sarabande) but with unique twists and compelling sonorities. Next was Richard MacDowell with Francaix's Theme and Variations, performed with great character and brave tempos! Williams then played another new work, Cookbook by Kenji Bunch, a virtuosic set of movements about food. The piece took a surprising turn at the end when the pianist AND the page turner began clapping and tapping rhythmically along with the clarinet! Two standard works rounded out the program, Bartók's Contrasts (MacDowell) and Mendelssohn's Concert Piece No. 2 (MacDowell and Williams). Overall, the new works were very well-received, and the crowd (which nearly filled Bates Recital Hall) was very appreciative of the hosts of ClarinetFest 2010. Next, I heard Richard Nunemaker's performance of Richard Lavenda's (Rice University) Quintet for Clarinet and String Quartet. This substantial work evoked Bartók in its motivic vitality and dissonant, angular sonorities. Particularly nice was the second movement, which featured clarinet multiphonics in combination with string harmonics. There is so much going on here at ClarinetFest that Kellie and I can't possibly see and hear everything. If you would like to share your ClarinetFest experience, please comment below or send us an e-mail! Enjoy the festival! Have you ever looked in your closet and thought, if only I had more clarinet-related apparel? 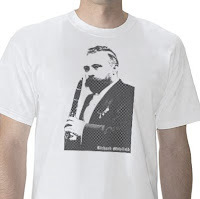 If so, Clarinet-Now.com is here to help, with a selection of items including a Richard Mühlfeld/Brahms T-shirt and clarinet high-top shoes available through the Clarinet-Now Zazzle Store. For even more clarinet-related gifts, check out this page. Normally we try to keep commercialism to a minimum here on Clarinet Cache, but we couldn't help but tell you about this site, because it offers much more than just these products. Clarinet-Now.com was created by Christopher Jones, a clarinetist in the Greater Hudson Valley area of New York State and student of Kalmen Opperman. The site has many inspirational strategies and tips for sight-reading, scales, crossing the break, and more, with great photos of correct and incorrect embouchure and hand position. The numerous ads are somewhat distracting, but the content of the site is useful, especially for beginners (and their parents), and teachers looking for a new way to explain specific aspects of clarinet technique. Keep up with the latest on the Clarinet-Now blog. Adding to our list of websites for free sheet music, the Sibley Music Library of the Eastman School of Music has amassed an extensive collection of digitized works, many by composers from the 19th to the early 20th century. With over 183 PDF files of chamber music and solo repertoire for clarinet, this collection of works covers lesser-known compositions as well as a handful of pieces by mainstream composers (Weber, Mozart, Brahms). A number of pages containing exercises and duets from Lazarus's New and Modern Method Book, along with several dissertations and theses from the 1940's-1970's are worth taking a look at. All of the music listed on the website is in the public domain and a user account is not necessary to download the music--you many need to stock up on printer ink though. Over at The Buzzing Reed, David H. Thomas has published a podcast of an interview with clarinetist Sidney Forrest. Thomas was a student of Forrest at Interlochen and Peabody, and now performs as principal clarinetist of the Columbus Symphony Orchestra. The interview, which is about 30 minutes long, features Thomas speaking with the now 91-year-old Forrest about a variety of topics including his study with Simeon Bellison, his own pedagogical techniques, and why he chose the clarinet ("I liked the name"). This an interesting listen and a great way to document a part of clarinet history! 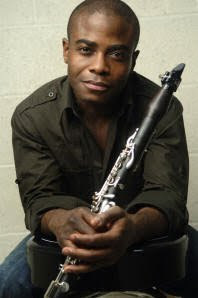 Anthony McGill is well-known in the United States for his work as principal clarinetist of the Metropolitan Opera Orchestra and as an accomplished chamber musician. He captured the attention of many around the world with his performance with Itzhak Perlman, Yo-Yo Ma, and Gabriela Montero at the inauguration of President Barack Obama in January 2009. On faculty at the Peabody Institute and the Mannes College of Music, McGill recently developed an educational iPhone application for clarinet. He blogs, tweets, and posts YouTube videos, and we at Clarinet Cache spoke with Anthony McGill about how he uses new technologies to educate and communicate. Clarinet Cache: Your newest project, the "Clarinet in Reach" application for the iPhone, was recently released by the company Music In Reach. How did you become involved with the application and what was the collaborative process like? Anthony McGill: I was approached by John Ferland and his brother Dan sometime this past year and they told me what the project was all about. I thought this was an amazing concept and soon after agreed to work as a consultant on the project. The collaboration was great. They would provide an outline and I would fill in the blanks. It was very straight forward. I would provide all the musical data and they would work out the tech side. CC: The iPhone app currently has fingerings only up to altissimo G, and the instructional videos from your YouTube channel are for beginners. Do you have plans to add fingerings and other content to make the app more useful for professionals, or is it aimed at a younger student audience? AM: Yes. We have decided to make it very usable for beginners and intermediate students alike. Since this is the first version we didn't feel the need to add super high notes for the segment that may use it right now. In the future we may have all kinds of advanced content. CC: Many artists use blogging as a promotional tool, but you recently started a blog that seems to be more about your personal insights and experiences as a professional classical clarinetist. What inspired you to create the blog and what kind of audiences do you hope to reach? AM: The website anthonymcgill.com was the first step and I thought it would be nice to have a place to connect with people directly. The content that I have on it came from just sitting down and writing about whatever I felt like. I could go from announcing the new iPhone project to writing about how a rehearsal inspired me. I am letting it take me wherever it wants. CC: As social networking sites like Facebook and Twitter grow in popularity, do you think that the Internet has changed what it means to be a classical musician in the twenty-first century? AM: I believe so. I feel that any chance I have as an artist to be a communication entrepreneur is great. And with so many avenues out there to do that, sites such as Facebook and Twitter have made it very easy for all of us to increase our connection and presence in the world. As musicians the more ways we can communicate, the better. CC: Do you find that there are benefits (or drawbacks) from being able to communicate directly with your friends and fans? AM: I think there are great benefits and I haven't noticed any drawbacks at all. Because in years past there was no communication whatsoever, I feel that being able to get emails or questions from young students about their playing, what repertoire they should be working on, all of these things without knowing them at all is awesome. CC: At 30 years old, you are probably younger than many of your colleagues in the Metropolitan Opera Orchestra. Do you think your age contributes to your openness towards blogging and other new forms of communication? AM: I think that it does. I still feel like I don't know what I'm doing every day, but it has become something that I think is really interesting and new. I think that we are at the beginning of a new way of communicating and connecting. I jumped on the train and I want to be on it as an artist of the future. CC: In December of 2006 the Met began releasing live performances in movie theaters and recently began the Live in HD program which offers transmission of live operas to select public schools at no charge. As a performer and teacher, do you think this approach to gaining wider audiences will affect the future generation's involvement in the performing arts? AM: I hope these productions are reaching a younger audience. But I think the most important thing is for it to reach a larger audience. Old, young, or in between, I think it is awesome. If we could get them in more schools and then inspire the cities to invest more in music and not cut these programs, I think that would be the best thing. Connect the success of the program with the success of students in school. CC: Many symphony orchestras and chamber groups seem to think that adding visual elements to performances, promoting concerts on Facebook, and "tweeting" during concerts will attract younger audiences. In your view, does this use of technology enrich the classical music experience, or cheapen it? AM: I think that it depends. If the technology enhances the art form I'm all for it. If it detracts and takes focus off of the music then it is detrimental. This is my opinion, but fortunately it is debatable. Debate and differences of opinion are actually extremely helpful to keeping the art form viable. Without trying new things the creativity dies. So I think some use of this is good. Tweeting while playing may be a bit counterproductive though! CC: Finally, many of us are curious about your experience performing at President Obama's inauguration. Can you tell us more about it and how you felt about participating in such a historical event? AM: It was an absolutely amazing experience. I was asked by Yo-Yo Ma to play after having played the Quartet for the End of Time with him in Japan back in 2001. It was the biggest surprise of my life to get this call. Being able to play with those amazing musicians and be a part of such a pivotal moment in history was something I'll never forget. I would play in the cold over and over again, crack many clarinets, recorded or not for the rest of my life to get back to that stage again! I will never forget it. The 52nd annual Grammy Awards are tomorrow, and we thought we'd take a look at the clarinet-related nominations. Clarinetist and composer Paquito D'Rivera has been nominated in two categories: "Best Classical Crossover Album" for his new album JaZZ-ClaZZ, and "Best Instrumental Composition" for the track "Borat in Syracuse" on the same album. JaZZ-ClaZZ is the result of a collaboration between D'Rivera and Sabine Meyer's Trio di Clarone. Listeners familiar with D'Rivera's composition Aires Tropicales for woodwind quintet will recognize several of the movements (including "Dizzyness" and "Vals Venezolano") arranged here for clarinets. The January 27, 2010 edition of PRI's "The World" included a nice feature on Paquito D'Rivera including an interview and audio clips from the album. Listen to streaming audio or download the podcast here. Syracuse University has posted an article about the commissioning and premiere of "Borat in Syracuse" by D'Rivera and SU’s Morton B. Schiff Ensemble. Another Grammy nomination goes to Gil Rose, Derek Bermel and the Boston Modern Orchestra Project in the category "Best Instrumental Soloist Performance (With Orchestra)" for Bermel's performance of his own Voices, for Solo Clarinet and Orchestra. Here's the full list of nominees from the Grammy Awards website. Best of luck to our clarinet friends tomorrow! Bass clarinetist Sauro Berti performing three movements of Jan Hadermann's "Spotlights on Bass Clarinet." Steve Cohen performing "Brooklyn Bridge" by Michael Daugherty. The band arrangement of Amilcare Ponchielli's crowd-pleasing "Il Convegno" features soloists Horácio Ferreira and Joao Pedro Santos. Other videos from the festival include a performance of Debussy's "Premiere Rhapsody" by the High School Competition winner, Carlos Ferreira. Last, but not least, this next video shows a unique ensemble consisting of a singer, guitarist, and clarinet quartet. Despite the shaky filming, the video manages to capture the excitement and merriment of both performers and audience. "The camera catches the jumping 10-piece group Goodman led from 1959-1961 (built around the Red Norvo Quintet), but in this clip, the spotlight stays firmly on Benny and Red. "The World is Waiting For the Sunrise" was an early Goodman showcase in 1934, and was memorably re-recorded by BG with Mel Powell in 1942 (for Commodore). Benny was still playing this number brilliantly in the 1980s!"